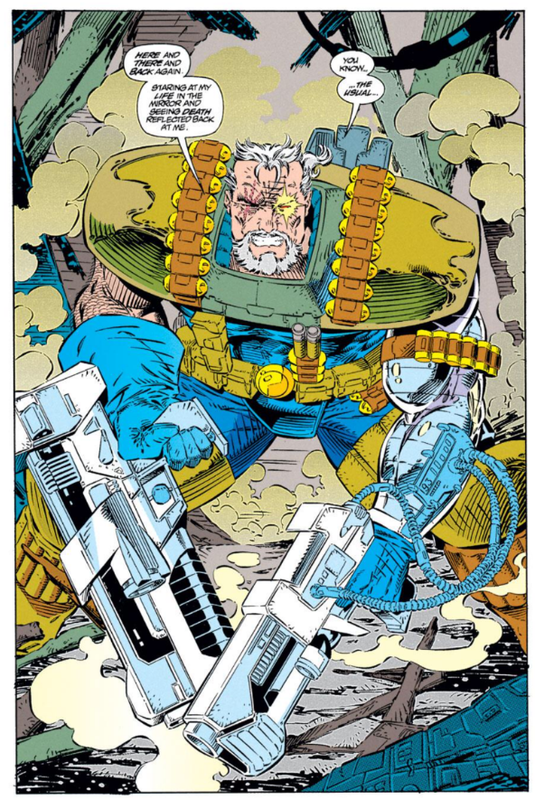 Cable emerges in his future time and reunites with Kane. Kane watches a recording of a battle involving Cable & his Clan Chosen teammates. Having become something of an expert on the Clan Chosen's exploits in the hopes of getting a better understanding of Cable, his activities draw the attention of the Citizens Protectorate's General Haight, who wants to prevent Kane from interfering with his plans. After Kane defeats some street thugs sent after him by Haight, he hires the Flatliners to capture or kill Kane. The Flatliners track Kane to the Clan Chosen's hideout, and they have the upper hand until Cable suddenly returns and helps turn the tide. Evacuating their base, Cable tells the Clan they need to go to Niagra, where the New Caananites have built a new Time Displacement Nexus. Meanwhile, General Haight offers Sinsear the opportunity get revenge on Cable by traveling back in time. At a base in the Adirondacks, Cable briefs the Clan Chosen on the Tinex, which is in Niagra Falls. Kane hopes it will enable him to return to his home time, and Cable reveals the New Caananites are planning on using it to maintain their control over the High-Lord ascension by killing someone in the past: Cable. Cable "returns" from "the dead" this issue, re-appearing in his future timeline (the one from which he originally journeyed to the "present" before his first appearance, and where he left Kane in the second issue of his previous limited series) about halfway through this issue, bringing to an end the very-brief period in which the character was considered dead following the end of "X-Cutiuoner's Song" (which was an even briefer period if you were paying attentions to solicits and ads, which started mentioning this series almost immediately after the character seemingly died). No explanation is given for how he survived/returned; that will come in issue #8. Jim Lee clone Art Thibert, who drew issues #12-13 of X-Men, draws this issue, though he'll only also draw next issue and part of #4, with the series not really getting a proper regular artist until Steve Skroce comes aboard with issue #13 (which means that, yes, this series went its entire first year of existence without a regular penciler, with no single artist ever drawing more than three consecutive issues in that time). This issue shipped remarkably late (though I don't know exactly how late; these things are hard to determine specifically), to the point that the letters page of the first issue (which is named "CableGrams") runs an editorial message apologizing for the delay and offering an explanation of sort (they blame vague "life happens" problems). I've never heard a full explanation for the book's lateness, though it will continue to be a problem past this first issue; the story I've heard is that the original intended artist (possibly Todd McFarlane clone Stephen Platt) dropped out at the last minute, leading to Art Thibert essentially "filling in" on the launch of a new series last minute, and contributing the lack of a consistent artistic vision for the series in its early goings, but I've never seen any explanation from any kind of official source (if you know of a creator interview or something out there that gets into it, let me know). The villain Sinsear makes his first appearance this issue; he will serve as the chief antagonist in the early issues of this series and the ostensible motivation for Cable's return to the present day of the current X-books, but largely disappears after that. Similarly, this issue introduces a whole bunch of new characters in the form of Cable's Clan Chosen allies, such as Dawnsilk, Tetherblood and Boak, none of whom are terribly memorable and few of whom who will appear outside the introductory issues of this series, along with a bunch of stuff setting up the politics and various factions in Cable's timeline, little of which matters down the road. The High Lord ascension, ostensibly Cable's at-this-time given motivation for traveling back in time in the first place (to guide Cannonball's ascension) is mentioned here, though it's mostly stripped of its connection to the Externals, and seems more tied to the general idea of maintaining Apocalypse's control over the world of Cable's time (and from here, Cable's battle with Apocalypse becomes much more the driving force behind his motivations/backstory, with the most of the High Lord stuff forgotten/ignored). 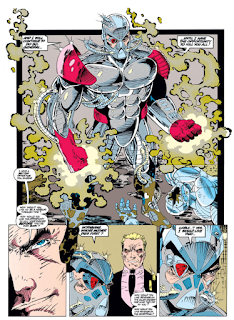 The opening pages of this issue, via Kane watching a recording of events, depict the death of Cable's wife Jenskot (mentioned before but appearing here for the first time), and the events surrounding the capture of their son Tyler by Stryfe, something previously mentioned by Cable in X-Force. 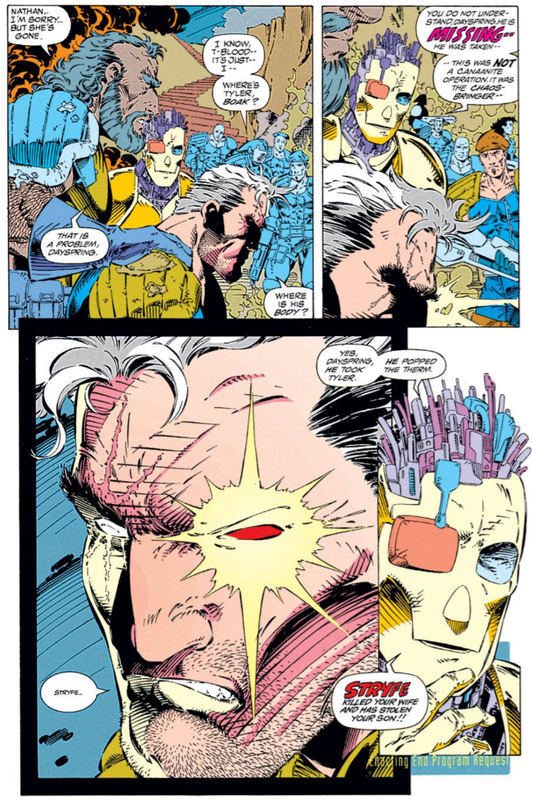 The biggest "reveal" from these events is the notion that Cable willingly sacrificed Tyler, and that Stryfe (a third faction in the fight between Cable's Clan Chosen and Apocalypse's New Caananites) is responsible for the death of Cable's wife (and the kidnapping of Tyler, but we knew that already). 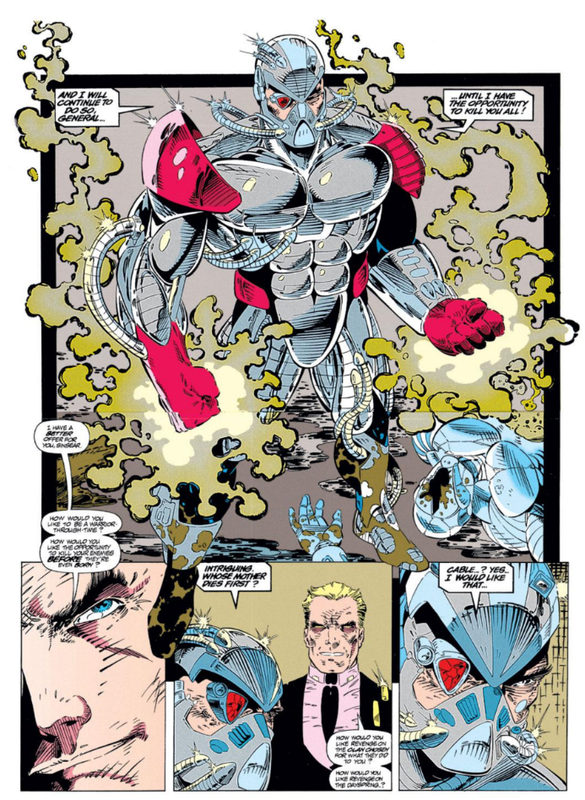 Cable sports a goatee in his return this issue; later issues will reveal that Stryfe and Cable are, at this point, sharing the same body, alternating control of it, with Stryfe being responsible for growing the goatee. Hot on the heels of Uncanny X-Men #300's prismatic foil cover, this issue features a wrap-around cardstock cover with a foil-embossed logo, and if most of the words in that sentence sound like gibberish to you, congrats, you didn't read many comics in the early 90s. Kane mentions that he's been in the far future where Cable brought him in the second issue of his limited series for a year. While planning their assault on the Tinex, the Clan Chosen operates out of X-Force's old base in the Adirondack Mountains, which in the intervening thousand years or so must have been repaired after being blown up in X-Force #13. In an example of how even the most well-intentioned and clever depictions of future technology have a hard time escaping fundamental notions of how tech works in the present day, while Kane is able to watch fully-rendered, 3D depictions of the Clan Chosen's adventures, complete with the ability to experience the emotions of the people being depicted, said records are still stored on physical media, specifically a CD of some kind. Kane is occasionally referred to as "Citizen Kane" by people, which might be Nicieza referencing the famous film, or just an accidental by-product of combining future-speak with Kane's name. On paper, the idea of a solo Cable series is not a terrible one: the character was extremely popular. a walking stereotype of everything in vogue in comics in the early 90s, and because two of those things were "mysterious past" and "time traveler", there was fertile ground for a series to explore and deepen the character, with a virtually-unlimited choice of possible settings. Wolverine had long proved a series starring just one of the X-Men could not only sell, but sell really, really well (even while, at times, consistently turning out some deeply mediocre stories). Combine that with the X-Men's thirtieth anniversary and the overall expansion/glutting of the market, and the existence of a Cable ongoing series is less the "Huh, really?" reaction it might garner from some fans today, and more of a "well, duh" kind of thing. In execution though, the series is kind of a mess, never quite finding its footing in either the X-Men narrative or the larger Marvel Universe, despite the valiant effort of at least a few decent creative teams and directions (and the probably-valiant efforts of far more...less-decent creative teams and directions). Unfortunately, this well-meaning but flawed first issue largely stands as a microcosm of the series as a whole. It shipped late, something which will continue to plague the series in its early days, with someone other than its intended artist providing the pencils along with a handful of inkers, a preview of the artistic struggles the series will encounter in its first year. 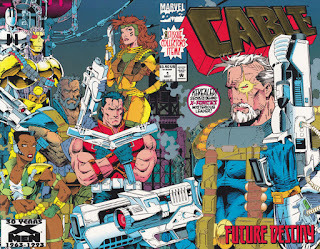 Starting off in the far future, with Kane as the point-of-view character, is fine, as it picks up a thread from the earlier Cable limited series while using a setting unexplored by other X-books (while offering potential information about some of the mysteries in Cable's past), but it also leads to Kane and a bunch of new characters readers know nothing about dominating the first issue of a series titled *Cable*. One could assume that Kane and the members of Clan Chosen are being setup to serve as Cable's supporting cast, and while it's not the fault of this particular issue, the knowledge that these characters will mostly disappear from the series by issue #3 does their introduction here no favors. 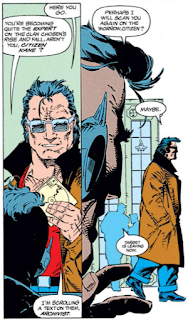 The focus on Kane also means that the title character doesn't make his first appearance (flashbacks aside) in his own book until roughly the halfway mark, and once he does, no explanation (even a vague one) is given for how he survived his rather dramatic "death" at the end of "X-Cutioner's Song". That explanation will come, and again, it's perhaps unfair to ding this first issue for not addressing it immediately, but when a new series launches starring a character who was last seen dying, the question of "how is it possible for a series to star a dead character?" isn't one that should be put on the back-burner. Again, nothing here is bad, on paper: there's the introduction of a new setting unique to the series, new characters to serve as a supporting cast and recurring villains, the promise of some needed clarification about the title character's past, and at least one familiar face to serve as a reader surrogate. 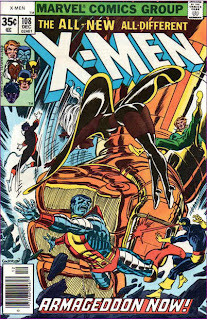 But in execution, it's all kind of confusing and inelegant, with perhaps too much of the unfamiliar thrown at readers too fast (especially once it becomes clear very little introduced here will last beyond the series' first issues), with the title character sidelined from the introductory issue of his own book for far too long. It's a muddled start, at best, which, in hindsight, also stands as a harbinger for things to come in the series. Next week, X-Men (vol. 2) #20, X-Force #22 and Excalibur #65. Oh god, I am truly beginning to admire your resolve and fear for your sanity as you wade further and further into the depths of the 90s. Stay strong, brother. Thankfully, I have nostalgia on my side to ease the pain, at least into the mid 90s - despite the warts, these are some of my favorite comics from when I was younger, so I'm still excited to review them. Once we get past "Onslaught", that nostalgic bloom will start to fade a bit (thankfully, while the quality at that point still varies, a lot of the inherent "90s-ness" starts to be toned down). But I bet you're totally proud to own a COLLECTOR'S ITEM, right? With all the "COLLECTOR'S ITEM" issues I own, I really should be a millionaire. This issue was "only" three weeks late. "I've never heard a full explanation for the book's lateness, though it will continue to be a problem past this first issue; the story I've heard is that the original intended artist (possibly Todd McFarlane clone Stephen Platt) dropped out at the last minute, leading to Art Thibert essentially "filling in" on the launch of a new series last minute, and contributing the lack of a consistent artistic vision for the series in its early goings, but I've never seen any explanation from any kind of official source (if you know of a creator interview or something out there that gets into it, let me know). " Thibert WAS the originally intended artist. There was a whole interview with Nicieza in Previews (the one that, um, previewed Cable 1) where Nicieza talks about how Thibert had to design a future. As for Platt, he wasn't even working for Marvel at this point- his first major issue was Moon Knight 55, which was cover dated October 1993, and he was offered Cable after the fans liked his art in that issue. I seem to remember Fabian suggesting it was Thibert's fault the book was late- he said "some people need to get their priorities straight"- I think that a later letter writer references that interview. Fabian intended the issue to end with the splash of Cable showing up but Harras thought the first issue of Cable's series should actually feature... Cable. Ah, good point on Platt. Like I said, I've heard that story before, but never been able to source. Makes sense why not. I've also heard that bit about Harras wanting Cable to be in his own series (which is a legitimately good editorial override); I meant to mention it in the post. You are correct about the fact that Stephen Platt was, at one point, slated to be the regular artist on CABLE, but that wouldn't be for another year, after he gained a fanbase from his run on MOON KNIGHT. At that point, Platt was swiped up by Rob Liefeld's Image studio to take over as the new artist on PROPHET. Which is, presumably, how we ended up with Steve Skroce on CABLE, instead. I have no idea why the book couldn't hold down a regular artist for the first year of its run. 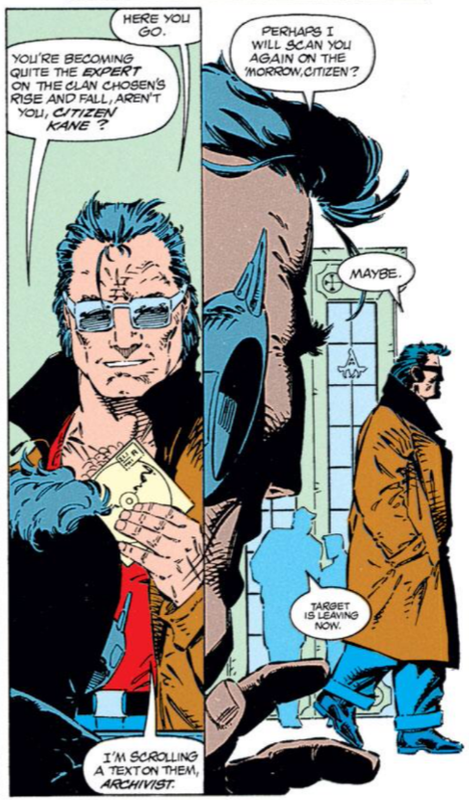 a walking stereotype of everything in vogue in comics in the early 90s, and because two of those things were "mysterious past" and "time traveler"
So he's essentially Wolverine and Rachel Summers fused together. It's "Tinex" btw what they're about to assault. "Time Replacement Nexus". Assaulting Timex would be such a pimp articles thing to do, and Cable is a serious character and has nothing to do with a clown like Deadpool. It's a nice touch that they got their own Zero-like android (recently revealed to be from the future along with Stryfe in "X-Cutioner's Song") but called Eleven with appropriate markings. I know nothing about the series (and subsequently got heavily spoiled about the goatee), so I'm gonna assume they got him from Stryfe who has the prototype unit "Zero" and will eagerly wait to learn how off I was. I fixed Tinex, thanks (though I agree, "Timex" would be better). For what it's worth, Marvel.com too has is wrong on their site. But actually I meant to strongly advocate against "Timex". We're surely in the 90's when watching isn't enough anymore and you full-force assault the watch men. I appreciate that this series tried to settle questions about Cable and just get on with things, but boy is this a horrible book for the first year. And when Jeph Loeb is a step up, you know the series is clearing a very low bar. I'm pretty sure I never read a single issue of CABLE "first run" aside from the "Phalanx Covenant" installment. However I did go back at some point and pick up #6 - 8 as back issues because they featured Mister Sinister, Cyclops, and Jean, and resolved whether Cable was a clone. But other than those four issues, my entire life has been remarkably free of any solo Cable action. I just realized Cable married a woman who's name is an amalgam of his parents' names. That is creepy. I think it gets established somewhere that "Jenskot" isn't her birth name, but one she took for herself. I bought this comic purely because I believed it *would* become a collector's item. 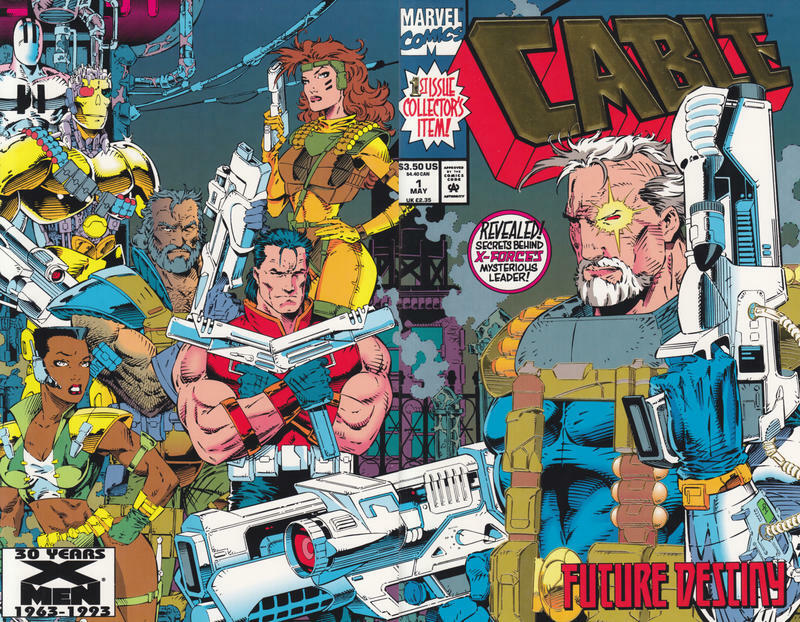 At the time, I had no interest in Cable (though I did end up buying the book regularly after the Age of Apocalypse). To this day, I still own it, but I do not believe I've ever read it. Many of the artists Bob Harras preferred in the '90s had their roots in Carl Potts' corner of Marvel (such as Jim Lee, and even Art Adams before him)...and surprisingly, G. I. JOE, with Andy Kubert, Lee Weeks, and I believe Ron Garney working on the book in the late '80s/early '90s. It's maybe not so surprising that Harras culled a lot of artists from G.I. JOE -- he edited that series for a few years (1986 - 1988) -- though the pencilers for most of his run at the time were mostly traditional guys like Rod Whigam and Ron Wagner. But maybe he kept his eye on the series after moving over to the X-office...? Even though I diss Harras, I do applaud him for bringing Peter David in to write the Hulk back in 1987. Good call for sure. “Hard men make hard choices. “The hardest of them make the choices first and deal with the consequences later. Plus his head is shaved and/or just bald between the top and the temples, making it look like he’s wearing a ridiculously unkempt toupee. While I’m hardly an eager apologist for the ’90s, Cable as its own series feels like a leading contender for a solo spinoff title in the X-stable. His long, mysterious or at least heretofore unrevealed past and the characters who populate it parallel Wolverine’s (if more directly thanks to kewl-by-numbers design) — other times and places where he’s made a bit of a life could be his Madripoor, Japan, Canadian Rockies, etc. Meanwhile, X-Force would be allowed to remain its own thing without him. All that said, I was barely interested in seeing whatever's to come in Cable even before the extreme caution against expectations in this post. Given that time travel is involved we could easily have seen a Cable from his own past, unfamiliar with Kane, pop up. Once it dawned on both men what their relative positions in Cable’s timeline were he might have felt burdened or energized by the knowledge of his apparent death, especially since he already looked much like Kane remembered him and thus the event would likely not be too far in his personal future. That isn’t the most original of scenarios, especially from our vantage point of over two decades later, but if nothing else even the suggestion of such a storyline would have been a valid feint on Marvel’s part to keep readers unsure of whether Cable really died or not in that battle with Stryfe.